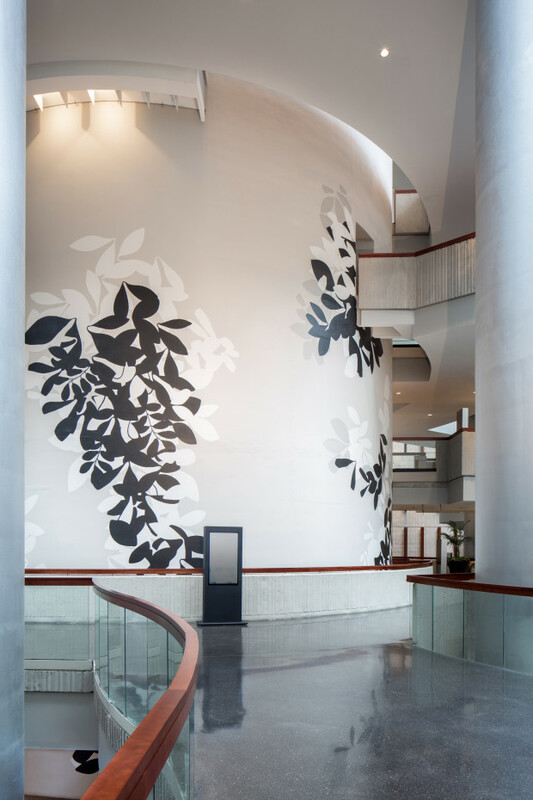 Art Initiative and Carolyn Auger Joiner of blackdog studio proposed a grand scale wall painting of the nearly 100 ft high concrete core of the iconic John Portman-designed Westin Peachtree Plaza by the artist Raymond Saa. The artist brush painted the entire painting while the hotel remained open, providing guests with the rare opportunity to watch the monumental painting evolve on a daily basis. The artist was, at points in the commission, painting at heights over 80 ft on an interior boom lift. The project was completed in approximately 3 months. The primary goal was to turn the central architectural concrete core that had been covered by a mauve velvet curtain for more than a decade into an original monumental work of art. 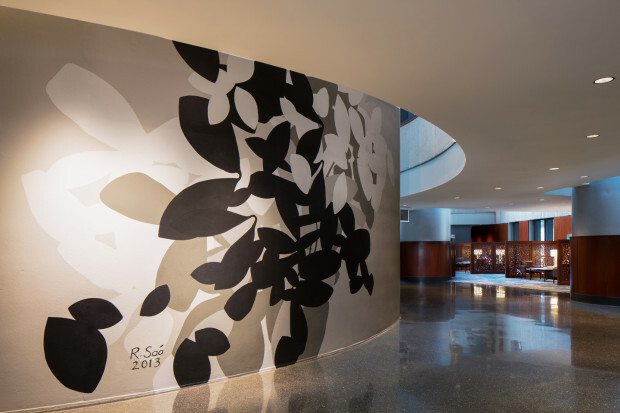 The painting of the core by the artist, Raymond Saa, was critical to the overall design of the space as it is the central focal point of the iconic round building designed by famed architect John Portman. 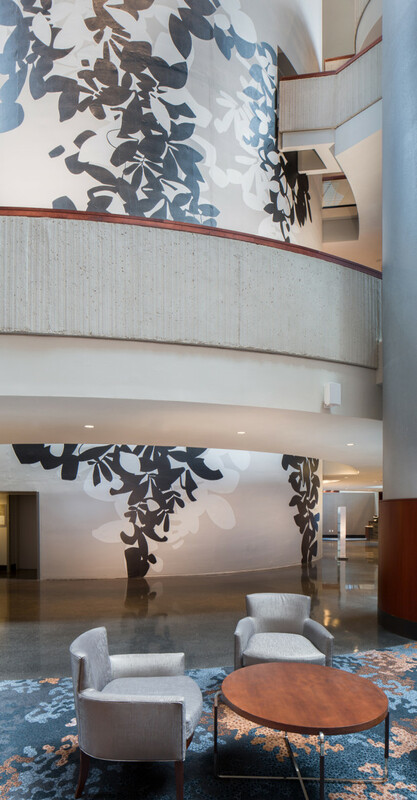 The finished painting entitled "Full Circle" is the visual showpiece of the recently renovated hotel and can be viewed full circle, from 4 levels in the open lobby. 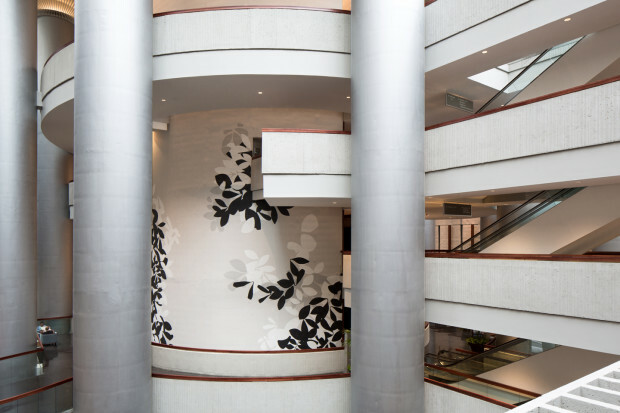 Art Initiative worked closely with the interior designer, blackdog studio and Starwood Hotels to ensure the parameters of the project were managed throughout the process. Artist selection was critical to a project of this scale and importance, and after careful consideration, Art Initiative proposed the artist, Raymond Saa based on the consistency in his abstract organic paintings and his previous experience with large scale projects. 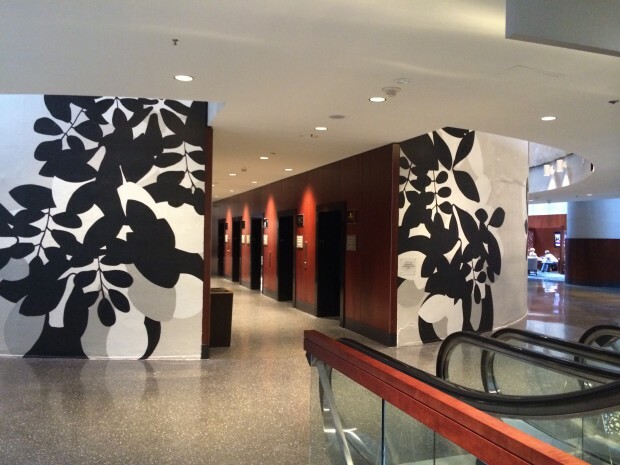 Once the compositional sketches were approved, we had to confront the real-life challenges of painting a nearly 100 ft high circular concrete wall inside a working hotel. The artist was required to become a certified boom lift operator, and then grapple with the daily safety concerns of free-hand brush painting the composition while suspended in a metal lift basket wearing a safety harness and interacting with the awestruck hotel guests. Our goal was to have the artist create a timeless, beautiful finished painting that would be of enduring value and inspiration to the hotel and its guests for many years to follow. What we did not anticipate, was the sheer joy and fascination that both hotel staff and guests experienced while interacting with the artist while he created the piece.